On a recent sunny afternoon in San Juan Capistrano, an Orange County Sheriff’s Department (OCSD) deputy slowly drove along San Juan Creek in search of homeless camps. “A lot of people think cops are the ones criminalizing the homeless. As a homeless liaison officer, and every city pretty much has one or multiple, we’re always trying to just help people get off the street,” Orange County Sheriff’s Department Deputy Chandler Pierce said. Less than two minutes into the first stretch of daily rounds along San Juan Creek for Deputy Chandler Pierce’s day, a middle-aged woman flagged him down along the trail. The woman, a San Juan Capistrano resident who lives nearby, approached the squad car and expressed concerns of a few tents at the base of the creek, which is near an elementary school. Pierce told her he was already on his way to check it out. Pierce drove a few more feet along the creek, surveying the creek and quickly spotting a small cluster of tents. Three people identified themselves, two were homeless: a woman from Laguna Niguel in her early 20s, a middle-aged man who said he’s “from around town,” and a San Juan Capistrano resident who said he’s a friend of the pair and brings them food and supplies, but he won’t house them. Pierce asked the group why they were there, if they have a record, if they needed help and what they need. After the group denied assistance, Pierce let out a sigh, got back into his squad car and conveyed his frustrations of day-to-day irritations that come with being the city’s dedicated homeless liaison officer. “A lot of people think cops are the ones criminalizing the homeless. As a homeless liaison officer, and every city pretty much has one or multiple, we’re always trying to just help people get off the street,” Pierce said. After checking the river bed, Pierce drove through San Juan Capistrano to the usual spots for other homeless people, in alleyways, parks and shopping centers. When he approached another group of local homeless people, many of whom Pierce sees and talks to daily, there was a fine line of firmness and gentleness he had to walk. Pierce estimates that of the 15-or-so homeless people in San Juan Capistrano, about 10 are homegrown. One person who Piece sees regularly is a sixth-generation San Juan Capistrano man, who typically stays at a local park. The soft-spoken, middle-aged homeless man, who asked to not be named, admitted that if he wanted services, he could get them, but he has no desire to because it’s easy to buy and use drugs living on the streets. He said he’s fairly comfortable in the park. Family members will come by to visit; his belongings include small furniture items and even a pair of wine glasses. Pierce said the irony from the general public when it comes to the homeless issue is that they don’t want people to be homeless, especially here, but they’re willing to give out free food and clothing. There’s a lot of theories floating around California’s growing homeless population of more than 134,000 people, with a nearly 14 percent increase from 2016 to 2017, a U.S. Department of Housing and Urban Development report found. Some theories to the growing homeless population range from affordable housing and renters rights, to low wages and drugs. Pierce said he blames California Proposition 47, the Reduced Penalties for Some Crimes Initiative, which passed in 2014 and brought many drug-related crimes from felonies to misdemeanors. Harry Bradford, 63, spends his days near the train station in downtown San Juan Capistrano. Bradford is homeless and came to Southern California for a job opportunity eight years ago, moving from a small town in Kansas after work “dried up” in the oil industry. Bradford said he’s not one to use drugs, but he feels discouraged in finding work and housing because he’s applied to jobs across town and the surrounding area, but he hasn’t had any luck. Discussions related to homeless people in Orange County have been at a fever pitch. A lawsuit filed by Orange County Catholic Worker earlier this year alleges the county had not performed due diligence in providing homes for homeless people after trying to expel them from the Santa Ana riverbed. The climax of the issues came on Feb. 14, after the county pursued to have all homeless people vacated from the Santa Ana riverbed and, in response, federal judge David O. Carter issued a restraining order on local officials and mandated that the homeless be placed into temporary housing situations. That came in the form of hotel and motel vouchers that were valid for a minimum 30-day stay. Since the vouchers expired, the county and cities within its borders have been trying to develop a strategy to place them. Many of the some-700 people who were living in the riverbed were sent to behavioral health treatment programs and other services, while about 400 of them were not scheduled for services. Carter hosted several hearings following the expiration of the vouchers, including one where he ordered all the mayors of the county’s cities to come together at a meeting in April to figure out what can be done. The Orange County Board of Supervisors voted to place shelters in Laguna Niguel, Irvine and Huntington Beach, but backtracked on that idea in late March after they received backlash from the public. The county’s shelters include armories in Santa Ana and Fullerton that hold about 400 people, a shelter in the Santa Ana Courtyard that holds another 400 and the final shelter, the Bridges at Kraemer Place, will hold 100. Officials with Orange County Health Care Agency and Office of Care Coordination have continued to provide assessments to the homeless people with whom they’ve kept contact. In San Clemente, Family Assistance Ministries (FAM) has several shelters for victims of domestic violence and families who were either homeless or on the brink of becoming so, but they don’t operate an emergency shelter that accepts anyone. FAM also conducts assessments within the three cities in order to send people either to the appropriate services or into adequate housing. Friendship Shelter in Laguna Beach holds 160 each night. An adage that has become more frequent in recent weeks, “It’s not illegal to be homeless,” may be true but, San Clemente, Dana Point and San Juan Capistrano have laws that make staying in one place difficult. All three cities have laws that prohibit camping or setting up tents on public land, sleeping in a car overnight and public parks typically are closed from 10 p.m.-6 a.m. or midnight-4 a.m. or some other variation. San Clemente went even further in recent months to adopt laws that give private property owners the leverage to have people removed without reason at local businesses and in the canyons, which people fear could be in danger of catching fire during dry months due to people using propane tanks to cook food. In San Juan Capistrano, a fire did break out in San Juan Creek a few months ago from a homeless person cooking food, Pierce said. 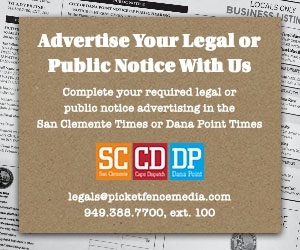 The San Clemente laws also allow for property owners to have people removed if they panhandle. The Orange County Board of Supervisors recently voted to spend $70.5 million of Mental Health Services Act funds to provide assistance in placing homeless people in permanent housing. What that will look like remains to be seen. 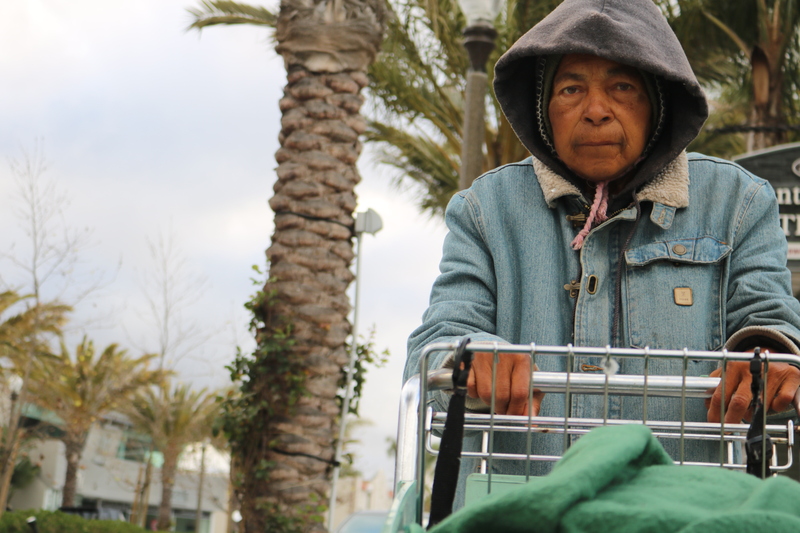 Susan Price, the director of the Orange County Care Coordination, referred to a lawsuit in Los Angeles in 2006 in which the judge decided as long as laws are made to address homelessness, adequate housing for them must be provided. “We need regional participation among cities, cities that aren’t always full-service, to create a system outflow to some kind of emergency sheltering and prioritization of permanent housing, like what we did with the flood control,” Price said. Of the estimated 2,500 people who were unsheltered homeless, Price said the county has put at least half that many people into temporary sheltering and programs to help them. In Dana Point, the city has gone as far as drafting a community work plan to explicitly address homeless through its Homeless Task Force (HTF), made up of more than a dozen local stakeholder representatives. The four groups of stakeholders are defined as government, faith-based communities, nonprofit organizations and businesses. 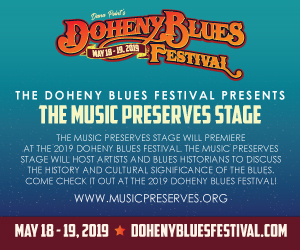 For example, the plan works through Dana Point Police Services’ abilities and policies for public awareness and path toward removal of the daily “feed,” at Doheny State Beach by nonprofit Welcome Inn after the establishment of a new Saturday Engagement Program. The community work plan defines four desired outcomes concerning homelessness in Dana Point: that homelessness in Dana Point is reduced, Dana Point’s public spaces are welcoming and safe for residents and visitors, Dana Point’s residents and businesses are well-informed of homeless issues and participate in a solution, and homeless residents stay safe, healthy and law abiding while awaiting housing or readiness to accept services. These measures are intended to provide insight on the progress made on homelessness. The data and information gathered from the measures will be used to reassess and improve the city’s response to homelessness. The city’s goal is to track how its homeless population is changing and adjust a response accordingly. Currently, the plan is in a mandatory 30-day, public-comment period, and awaiting final approval from City Council. The community work plan draft document can be read here.